The Roman de la Rose Digital Library team proudly announces the addition of three new manuscripts to our digital library. These additions bring the total number of manuscripts up to 145. This new batch is especially interesting because they are owned by libraries outside of France–we have two new German manuscripts and one from Spain. Each of these were originally produced in France in the 14th and 15th centuries. Our first new manuscript, BH Ms. 387 comes to us courtesy of the Bibliotèca Històrica of the Universitat de València. With more than 160 beautiful miniatures, this manuscript is one of the most lavishly illustrated in the collection. Many of the illustrations span two columns in width. Heidrun Ost wrote an extensive essay about the illustrations in this manuscript. While it is not certain who commissioned the work, there is speculation that it was Philip the Bold, Duke of Burgundy. 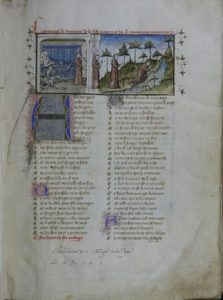 The style of illumination is similar to other manuscripts that the duke ordered for his collection. The Valencia Rose contains the usual text plus the “Testament de Jean de Meun”, the “Codicille de Jean de Meun”, and the “Articles de la Foy”. The second new manuscript, Cod. gall. 80 is part of the collection of the Staatsbibliothek zu Berlin. This 14th century manuscript has smaller and fewer miniatures than our Valencia example, but they are all in brilliant colors. In addition, there are many decorated initials on every page. Finally we have Ham. 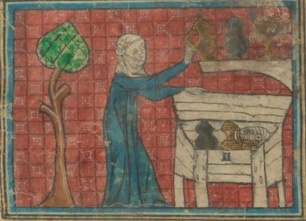 577, also from the Staatsbibliothek zu Berlin. In addition to the text of the Roman de la Rose, this manuscript has a “mystery” section at the end. This section has many geometric illustrations, and does not appear to relate to the Rose. Can you help us with this? Please post a comment on this blog post if you can help with any information. We owe a big debt of gratitude to the two libraries that supplied the images for these manuscripts. It is this type of community cooperation that enables us to continue to build this digital library. The Roman de la Rose Digital Library is currently being featured in an important exhibition called “L’art d’aimer du Moyen Âge: Le Roman de la rose” at the Bibliothèque de l’Arsenal in Paris. The exhibition began on 6 November 2012 and will close 13 February 2013. The exhibition displays around 100 manuscripts and a few printed editions. The exposition is organized according to two approaches: telling the story literally via manuscript images that portray the narrative (featuring “Français 1574“), and allegorically, also using manuscript images illustrative of this important aspect of the work. Panels of miniatures allow viewers to obtain a synthesis of the work’s different sections. On January 18, 2013 there will be a day-long workshop in which a group of Roman de la Rose scholars will discuss the question “Why should one read the Roman de la Rose today?”. Professor Stephen Nichols of the Johns Hopkins University will close the exhibition with a lecture about how and why digitization makes reading the Rose more meaningful today. Finally, the newest issue (no. 42) of the journal “Art de l’enluminure” features two articles about the Roman de la Rose. The first article discusses Fr. 378 and Rothschild 2800 and the second covers Fr. 25526. We are always interested in hearing about your Roman de la Rose scholarship, so please keep us informed via the “contact us” on the website.